German chancellor Angela Merkel sits next to US president Donald Trump before their meeting in the oval office in Washington on Friday. GERMAN DEFENCE MINISTER Ursula von der Leyen has rejected US President Donald Trump’s claim that Berlin owes NATO “vast sums of money” and must pay Washington more for defence. “There is no account where debts are registered with NATO,” Von der Leyen, a close ally of Chancellor Angela Merkel, said in a statement. She also noted that NATO spending should not be the only criteria used to measure Germany’s military efforts. 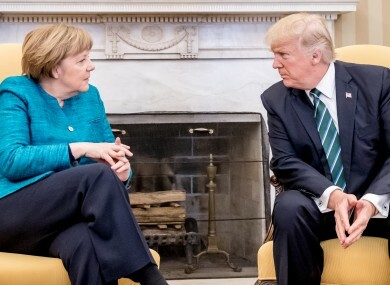 His tweetstorm came a day after Trump met Merkel in Washington, where the two leaders showed little common ground over a host of thorny issues, including NATO and defence spending. Merkel said Berlin had committed to increasing its military spending to 2% of GDP, a target NATO member states formally agreed in 2014 to reach within 10 years. Germany, whose wartime past has led it traditionally to be reticent on defence matters, currently spends 1.2% of GDP. Von der Leyen said on Sunday that Germany’s increased military spending would not only go to NATO but would also be used for participating in UN and European peacekeeping missions and to contribute to the fight against the Islamic State extremists. Email “Germany hits back at Trump claim that it 'owes vast sums of money'”. Feedback on “Germany hits back at Trump claim that it 'owes vast sums of money'”.